More than one-third of the 493 families who called Seattle’s Yesler Terrace public-housing project home in 2012 now live elsewhere, the City Council was told Monday. More than one-third of the 493 families living in Seattle’s Yesler Terrace public-housing project in 2012, before the area began to be redeveloped, are now living elsewhere. Another 130 families have moved into new or renovated public housing in the neighborhood, and 176 have stayed in units slated for demolition but not yet gone. Those numbers were part of a Yesler Terrace update Seattle Housing Authority (SHA) Executive Director Andrew Lofton gave the Seattle City Council on Monday. The $1.5 billion-plus ongoing redevelopment of the nation’s first racially integrated public-housing project is the latest SHA complex being turned into a mixed-income community. 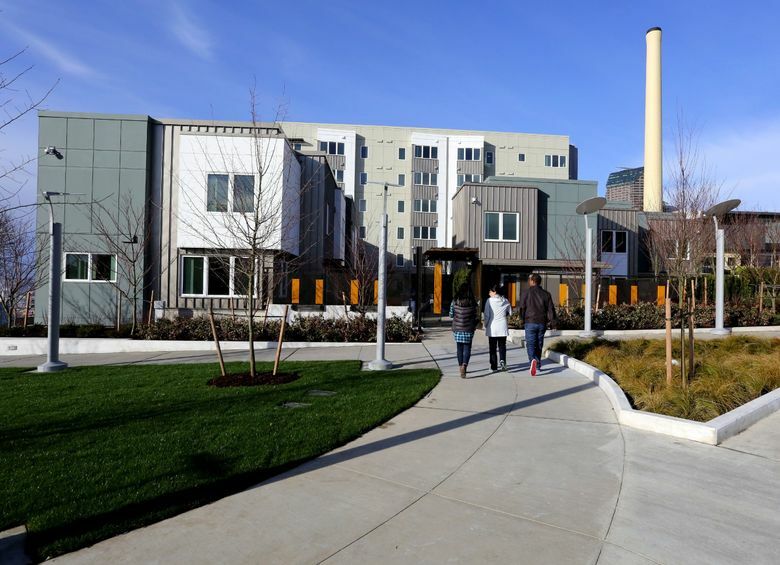 The agency has remade Holly Park, Rainier Vista and High Point that way, with new affordable housing partly underwritten by selling property to private developers. Some studies have praised such efforts, saying they break up concentrations of poverty. Others have suggested they benefit middle-class residents and developers. Yesler Terrace was built in the 1940s with low-rise apartments and small yards. Every original unit is being replaced with a new unit of public housing, and all the households being displaced are getting at least 18 months’ notice and the right to return if they want to. But the new neighborhood, perched on 30 acres between downtown and the Central District, will have many more market-rate apartments than public-housing units. There will be about 3,500 new market-rate units, with some built by Paul Allen’s Vulcan real-estate company. And the area will become much denser, with larger apartment buildings. In addition to public housing and market-rate homes, the new Yesler Terrace will include about 1,800 slightly subsidized homes for low- and moderate-income families. The area is being redeveloped in phases spanning many years. Eventually there will be a new 1.8-acre park, three pocket parks and space for community gardening. There also will be 88,000 square feet of new retail space and 900,000 of new office space. Longtime Yesler Terrace residents have questioned whether the area’s community spirit will live on with so many changes. Films “Even the Walls” and “Hagereseb” have recently sought to capture that spirit. Some families may never return. Cecile Allen, 54, said she’s lived in Yesler Terrace for almost 20 years. She’s in a building not yet torn down. Allen said she’s toured the new public-housing units and likes them, but needs a yard for her dog, so she may end up in another neighborhood. Of the 187 families who have left the neighborhood as their old homes have been demolished, 90 percent have moved within Seattle, according to SHA. Five percent have moved to other parts of the state, and 5 percent have left the state. All but three of the families have moved either to other SHA public-housing projects or to private housing with SHA rent vouchers. Two of the three have become homeowners and one has moved to Canada, according to SHA. The most popular destinations have been Holly Park, Rainier Vista and High Point, Lofton told the council. Original Yesler Terrace families will continue to have the option to return as more replacement units are built. In a couple of years there will be enough units for all of the families to return, though some may choose not to, an SHA spokeswoman said. The redevelopment as a whole is expected to last about a decade.